Is Heroin Rehab Aftercare Necessary? What is Heroin Rehab Aftercare? Aftercare helps build on the progress made in treatment. Since heroin addiction is a chronic, relapsing disease, aftercare is critical to solidifying and building on gains made in the critical days of detox, early stabilization and initial treatment. "The longer the duration of interventions such as aftercare, the better the outcome for maintaining recovery..."
The longer the duration of interventions such as aftercare, the better the outcome for maintaining recovery. While you may be discouraged about the rate of relapse among heroin addicts after treatment, you need to know that aftercare interventions do work. If you or someone you know and care about needs to begin the journey of treatment and aftercare, start with the small step of calling 1-888-993-3112Who Answers? and talking to one of our treatment support specialists who can help you with your questions and concerns. Relapse often happens, not as the result of environmental triggers—which may be encountered frequently during early recovery—but through the failure to cope adequately with negative emotions resulting from interpersonal conflicts and other problems or stressors. Effective relapse prevention will emphasize the repair of damaged relationships, helping to form new ones, working on lingering effects of trauma, and enhancing self-esteem and self-efficacy, in addition to learning skills which can sensitize those struggling with addiction to early warning signs of relapse. In a group setting, continuing care can be extended to a person who has relapsed on heroin. In this scenario, a compassionate group facilitator will 'model' how to overcome maladaptive thinking patterns and feelings which can trigger relapse. "Chronic illnesses are treatable and people recover, but lifestyle changes and interventions will need to endure for a lifetime to avoid relapse..."
Heroin dependency can be a long-term concern, similar to any chronic illness such as diabetes or heart disease. Chronic illness differs from acute illness in the sense that the latter condition passes with time and treatment, e.g. a bad infection. Chronic illnesses are treatable and people recover, but lifestyle changes and interventions will need to endure for a lifetime to avoid relapse. Relapse can happen with chronic illnesses, which does not mean that the treatment has failed, or that you are a failure. A study of relapse rates for the chronic illnesses of addiction, diabetes, asthma and hypertension found that addiction had a relapse rate of 40-60% compared to 50-70% for hypertension and asthma. Continuing work in aftercare may include trying alternative interventions which will work for you. That may take time, so don’t get discouraged if you cannot stay off heroin on your first experience with recovery. Repeated efforts to stay clean from heroin demonstrate an admirable resolve to embrace recovery – it's important not to become discouraged. You can call us today at 1-888-993-3112Who Answers? for help in finding the treatment and aftercare program which will best meet your needs. Don’t give up! Therapy/counseling and 12-Step support groups will continue to be an integral part of continuing care. Continuing care at its best provides comprehensive, or “wrap around” services, given the many areas of concern in a heroin addict’s life. Primary medical care, vocational rehab services, housing, new employment skills, and parenting skills are among the options available in continuing care. Group sessions are an integral part of most treatment programs. Compared with individual therapy, research findings show a lower rate of drug use amongst those who receive aftercare/RP in the group setting. There is an additional indication that couples treated in a group setting report improved relationships when compared to couples in individual therapy. One-on-one, or individual counseling benefits those who are not able or willing to disclose or discuss issues relating to their addiction-related problems. Compared to group therapy, it gives the therapist/counselor more flexibility in exploring or dealing with drug-related issues as they arise in the individual’s experience; and groups can’t easily manage that. CBT for addiction interventions has a great track record. It's critical components include identifying thoughts, feelings, and circumstances around heroin use. These coupled with behavior modification training greatly increase its effectiveness. Encouraging clients to practice and implement skills outside the counseling setting probably accounts for why it is so successful. Individuals struggling with addiction, like others, seek happiness and good health. In mindfulness-based treatment, the heroin use represents a “false refuge” in realizing this state of serenity and stability. Mindfulness emphasizes a type of meditation that helps a person manage unpleasant feelings, thoughts, and cravings by being open and cultivating a non-judgmental attitude. The result is an increased awareness of the passing nature of craving, a “calming” of the impulse to avoid “unpleasant” experience with the use of drugs, and the willingness to defer satisfaction/reward. 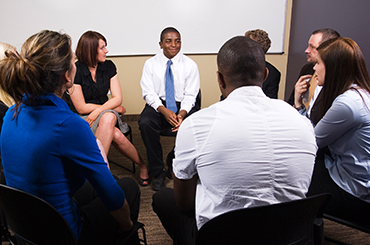 12-Step groups such as Alcoholics Anonymous (AA) and Narcotics Anonymous (NA) shift the treatment emphasis from management of acute symptoms in early treatment to facilitating long-term recovery/sobriety in the community, with abstinence as the goal and AA/NA as the vehicle for maintaining the goal. The group process involves sharing of one’s struggles, and receiving feedback based solely on the experience, strength, and hope of other members. An additional factor of the 12-Step group is spirituality, including surrender to a higher power without whose help recovery cannot be sustained. A recent study by the National Institute on Drug Abuse (NIDA) found that stronger spiritual/religious beliefs and practices are clinically significant in remission from drug use except for crack cocaine, with spiritual heroin users reporting 7% to 21% less heroin use compared to non-spiritual users. Long-term follow-up treatment with substitution therapy (methadone, buprenorphine, buprenorphine/naloxone) is an effective and well-established treatment option. Antagonist treatment with naltrexone (Vivitrol ®) helps to block the euphoric effects of heroin and is also considered to be effective in reducing cravings. While more research is needed, clinical and research data seems to support the transition to therapeutic doses of naltrexone over 3-5 days, along with buprenorphine and clonidine. While some treatment modalities claim that medication-assisted therapy (MAT) is simply substituting one addictive drug with another, heroin addiction is a chronic, relapsable disease which responds very well to appropriately-prescribed medication. Studies show a significant reduction in heroin/drug use when compared to those patients discharged without ongoing MAT. Patients on methadone maintenance (MMT) also show marked reductions in risky behaviors, such as shared intravenous needle use and risky sexual behavior. In the same study, those treated with buprenorphine or buprenorphine-naloxone (Subutex ®, Suboxone ®) showed 1-year retention rates ranging from 90%-60% with a greater reduction in drug use than those in MMT. Sober Living Communities are sometimes referred to as “Halfway Houses” and “Community Residential Treatment Facilities”, and typically receive clients who have completed intensive inpatient treatment. Better coping strategies, lower drug use, and skills training are the result of an emphasis on Twelve-Step support and supportive relationships in sober living facilities. They typically range in duration from 30-90 days. Therapeutic Communities (TCs) view addiction as a disorder of the whole person, which affects many areas of cognitive and behavioral functioning. It is especially beneficial for those who tend to be antisocial, or whose values are confused, nonexistent. Being a member of a Therapeutic Community can result in demonstrated reductions in drug use and crime, and improvements in employment and prosocial behaviors. The TC teaches individuals to harness the power of communal living to inform self-chance, primarily through peer modeling and consequential learning. Also known as a type of token economy, or voucher-based therapy, this intervention encourages adaptive behavior by rewarding the client for achieving recovery-oriented goals through clean urine screens, and/or attendance at aftercare sessions. A meta-analysis (a comparative study of available peer-reviewed articles) demonstrated the effectiveness of CM with patients receiving MAT as well as those who are not receiving any MAT. CM works well with pharmacotherapies such as naltrexone-assisted therapy, improving treatment compliance with naltrexone, and showing evidence of improved family functioning in family therapies. "Interpersonal and familial factors can contribute to the progression of addiction..."
Given the psychosocial nature of addiction, both the heroin-addicted individual as well as his/her family can benefit from focused recovery efforts. Multidimensional family therapy (MDFT) is an empirically supported family-focused therapy which specializes in youth drug abuse and family interaction. Interpersonal and familial factors can contribute to the progression of addiction. MDFT focuses on creating a practical and reachable alternative to drug use for the teen and enhanced emotional connection by the parent for the teen. This in turn fosters what some parents call “soul searching” of themselves, resulting in improved family functioning and cohesion. For the health and happiness of the individual struggling with addiction and the family, call us today at 1-888-993-3112Who Answers? for help with heroin recovery options to benefit you and your loved ones. Carroll, K.M. (2013). Cognitive Behavioral Therapies. In Miller, P.M. ed. Interventions for Addiction: Comprehensive Addictive Behaviors and Disorders. Volume 3. Boston: Elsevier, pp. 137-146. Carroll, K.M., et al. (2013). Targeting Behavioral Therapies to Enhance Naltrexone Treatment of Opioid Dependence: Efficacy of Contingency Management and Significant Other Involvement. Arch Gen Psychiatry 58(8): 755-761. Curran, V., and Drummond, C. (2013). Psychological Treatments of Substance Misuse and Dependence. In Miller, P.M., ed. Previously cited, pp. 209-240. DeLeon, G. (2013). Therapeutic Communities. In Miller, P.M., ed. Previously cited, pp.643-653..
Garcia-Portilla, M.P., et al. (2014). Long-term Outcomes of Pharamcological Treatments for Opioid Dependence: Does Methadone Still Lead the Pack? Br J Clin Pharmacol. 77(2): 272-284. Hser, Y-I, and Anglin, M.D. (2005). Chapter 20: Drug Treatment and Aftercare Programs. In Coombs, R.H. ed. Addiction Counseling Review: Preparing for Comprehensive, Certification, and Licensing Examinations. Mahwah, NJ: Lawrence Erlbaum Associates. Kingree, J.B. (2013). Chapter 15: Twelve-Step Facilitation Therapy. In Miller, P.M. ed. Interventions for Addiction: Comprehensive Addictive Behaviors and Disorders. Volume 3. Boston: Elsevier, pp.137-146. Liddle, H.A. (2013). Multidimensional Family Therapy for Adolescent Substance Abuse: A Developmental Approach. In Miller, P.M., ed. Previously cited, pp. 87-96. McClellan, A.T., and McKay, J.R. (2009). Integrating Evidence-Based Components into a Functional Continuum of Addiction Care. In Ries, R.K. et al., editors. Principles of Addiction Medicine. Fourth Edition. Philadelphia: Lippincott, Williams & Wilkins. McKay, J.R. (2009). Continuing Care Research: What We’ve Learned and Where We’re Going. J.Subst AbuseTreat 36(2):131-145. Schoenthaler, S.J., et al. (2015). NIDA-Drug Addiction Treatment Outcome Study (DATOS): Relapse as a Function of Spirituality/Religiosity. J Reward Defic Syndr 1(1): 36-45. Sigmon, S.C. et al. (2012). Opioid Detoxification and Naltrexone Induction Strategies: Recommendations for Clinical Practice. Am J Drug Alcohol Abuse 38(3): 187-199. Toneatto, T. (2013). Mindfulness. In Miller, ed. Cited previously, pp. 219-226. Washton, A.M. (2011). Group Therapy. In Ruiz, P., and Strain, E.C., eds. Lowinson and Ruiz’s Substance Abuse: A Comprehensive Textbook. Fifth Edition. Philadelphia: Lippincott, Williams & Wilkins, pp.575-583.